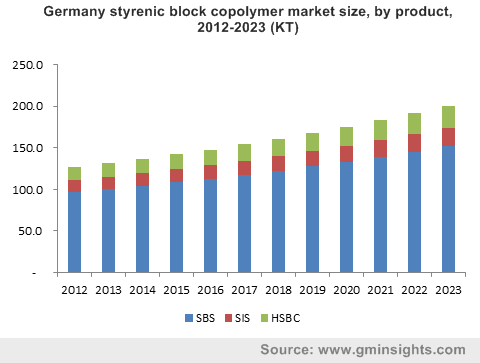 Styrenic Block Copolymer (SBC) Market size was over 1.95 million tons in 2015. The industry expects gains at over 4.5% CAGR up to 2023. Global baby diapers market size is set to surpass USD 64 Billion by 2023 from USD 39 billion in 2014, with estimated gains at 6% up to 2023. Growing baby health concerns accompanied by increase in purchasing power are key stimulating factors to drive global styrenic block copolymer market size. These are mainly used to manufacture waistbands, ears/side panels, tabs, leg elastics and landing zone in baby diapers. Improved comfort and fit of diapers owing to elastomeric materials led baby diapers manufacturers to adopt compounds including SBS, SIS, SEBS, SEPS and SEEPS may drive product demand. SBC compounds accounts for 40%-85% by weight of the overall baby diapers, the rest being accounted by thermoplastics. Asia Pacific and Latin America are may grow significantly in terms of baby diaper consumption. Population growth accompanied by rise in disposable income should influence the regional styrenic block copolymer market growth. Global footwear market size was estimated at over USD 190 billion in 2014and is forecast to be worth more than USD 211 billion by 2019. High resilience strength is among the key properties to favor growth in footwear industry. Rising trends to replace polyvinyl chloride (PVC) due to health hazards associated with its usage should favor industry penetration in the medical sector. Medical bags, medical tubing, and syringes are the suitable products to manufacture from the material. Approvals from FDA and U.S. Pharmacopoeia to use the material in medical industry owing to reduce dependency on PVC should propel SBC demand. Crystal clarity, design versatility, high resistance, excellent thermal stability, sterilizable by gamma irradiation, ethylene oxide gas, mutagenic or irritant potential are the key properties to favor styrenic block copolymer market size. Key raw materials, crude oil and natural gas involved in SBC production. Fluctuating raw material prices owing to political unrest may affect styrenic block copolymer market price trend. SBS market size was dominant and generated more than USD 4.5 billion revenue in 2015. Rapid footwear and baby diaper industry expansion owing to increasing consumer affordability are expected factor to influence product demand. In terms of volume, hydrogenated styrenic block copolymer market size is forecast to attain highest growth rate, with more than 5.5% up to2023. Rising trend to procure sustainable adhesives & sealants in construction industry is projected to foster hydrogenated styrenic block copolymer market growth. Paving & roofing dominated the application segment and was valued at over USD 1.95 billion in 2015. Growth in construction industry expansion coupled with rising consumer preference for customized home interiors are the key trending factors to positively influence paving & roofing industry. Footwear application is set to grow at more than 4% CAGR up to 2023. Material sustainability and durability are among the key factors to stimulate demand in footwear application. Change in buying behavior and trend to customize footwear for diverse purposes is another lucrative factor to drive demand. APAC, led by China styrenic block copolymer market size, was dominant regional industry and was worth over USD 2.65 billion in 2015. Rapid industrialization coupled with manufacturing industry expansion owing to skilled labor availability are the key trending factors to fuel material demand. China is among the major footwear producing country followed by India; increasing SBC usage in footwear should positively affect the regional industry growth. U.S. dominated the North America styrenic block copolymer market size and is forecast to grow at over4.2% CAGR up to 2023. FDA approvals to use SBC in manufacturing medical equipments are the key favorable factors to stimulate product demand. Huge construction & building industry investment potential in Saudi Arabia and UAE to foster MEA styrenic block copolymer market growth. The region is projected to grow at more than 4.8% CAGR up to 2023. Global styrenic block copolymer market share is consolidated; Sinopec, Dynasol LCY Chemical, and Kraton were the leading company in 2015. Other market participants include BASF, Zeon Corporation, Chi Mei Corp, Versalis, Styrolution, TSRC, Denki Kagaku Kogyo Kabushiki Kaisha, Momentive Specialty Chemicals, LG Chemicals, Chevron Phillips, En Chuan, Asahi Kasei, JSR Corporation, Kumho Petrochemicals and JX Nippon Oil & Energy Corporation. In recent years the industry has witnessed some significant changes as major resin suppliers have integrating their operations forward and stepping into the SBC compounding business. SBC is the largest consumed product of thermoplastic elastomers (TPE) market. It is used where high performance polymers are needed. SBCs shares properties similar to rubber but they process like polymers. These are lowest priced thermoplastic elastomers owing to their bulk consumption. SBCs are generally used with a host of other polymers and additives unlike other members of thermoplastic elastomers which are used seldom. Additives are added in order to formulate the final compound which meets the exact specifications. Moreover, research is continued to develop materials which meet the end use industries requirement. These copolymers are generally classified as unhydrogenated and hydrogenated. SBCs use styrene, butadiene and isoprene as the basic raw material to form many other compounds which are used in asphalt modification, footwear, adhesives and coating industry. HSBCs are produced by hydrogenation of USBCs. HSBCs are further classified as styrene ethylene butylene styrene and styrene ethylene propylene styrene, styrene ethylene propylene styrene. HSBCs are used for niche applications and are relatively high performing compounds when compared with USBCs. HSBCs offer higher profit margins compared to USBCs as they are used across a host of niche applications. Regulatory policies, to reduce sulfur level have increased lubricity improvers demand, a trend that is predicted to continue as the industry shifts focus to producing alternative transportation fuels. Moreover, innovation of advanced engine technology has created opportunity in diverse fuel additives for different purposes. Increasing biofuel consumption may affect the global additive market. Rising cleaner fuels demand such as LPG and CNG is another factor. Due to increase in other fuel demand, the global fuel additives market for conventional fuels is predicted to be adversely affected in near future.